"The production takes place in the fictional Russian town of Helmsbergville. The playwright describes it as "a worn-out village, the kind of village in which the houses droop off of hillsides and the people droop through the streets." In my research I discovered a painting by the Russian artist Antonov Nikolay (see below). The painting is simply titled “In Village”, and it provided the initial inspiration for the set design. Set design, hershel and the hanukkah goblins, michael Hoover. Another aspect of the design is that I hoped to keep the set pieces from feeling too heavy or clunky. I challenged myself to try to create a setting using only sticks of lath board cobbled together. The design then evolved into a morph of the painting onto the compilation of sticks, resulting in a playfully abstract little setting in front of which our story can be told!" 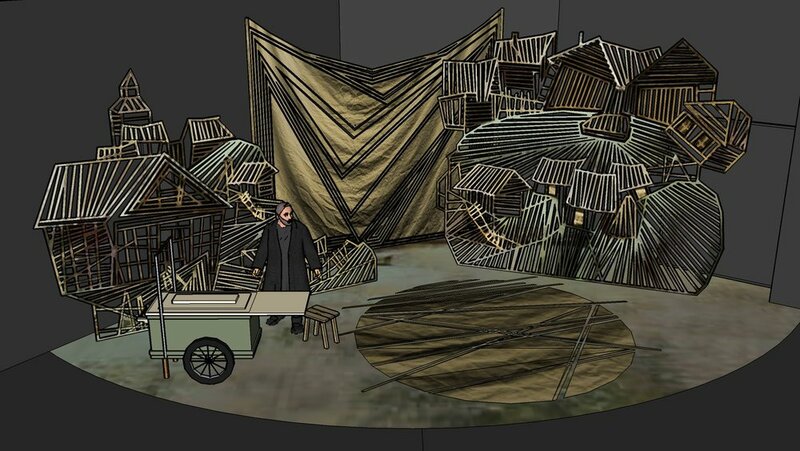 Michael designs sets locally for many theaters, including Uncle Vanya, Choir Boy and Proud to Present at the Guthrie Theater, Ragtime and Gypsy at Theater Latte Da and Idiot’s Delight at Girl Friday. In addition to his freelance career as a scenic designer, Michael is on staff as the Lead Scenic Artist at the Guthrie Theater.